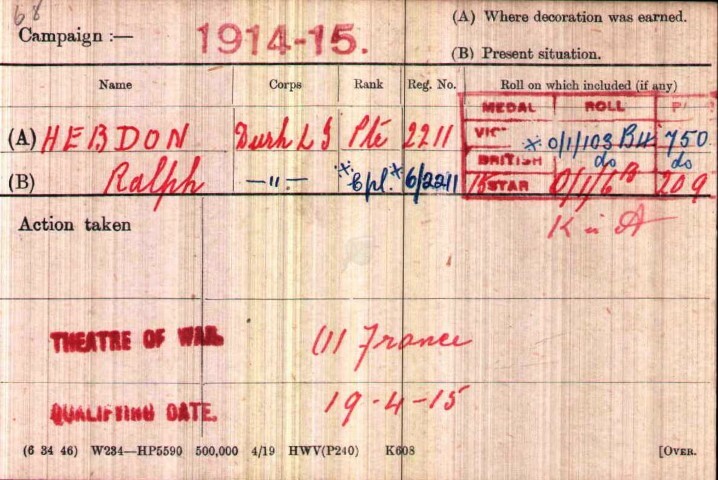 2211 Corporal Ralph Hebdon 1/6th Battalion, Durham Light Infantry was killed in action 5 November 1916. He was about 26 years old and is buried at Warlencourt British Cemetery, France  and commemorated on the St. Helens Colliery Memorial Cottages. The Battle of the Somme was viewed as a breakthrough battle, as a means of getting through the formidable German trench lines and into a war of movement and decision. Political considerations and the demands of the French High Command influenced the timing of the battle. They demanded British diversionary action to occupy the German Army to relieve the hard pressed French troops at Verdun, to the south. General Sir Douglas Haig, appointed Commander-in-Chief in December 1915, was responsible for the overall conduct of British Army operations in France and Belgium. This action was to be the British Army’s first major offensive on the Western Front in 1916 and it was entrusted to General Rawlinson’s Fourth Army to deliver the resounding victory. The British Army included thousands of citizen volunteers, keen to take part in what was expected to be a great victory. The main line of assault ran nearly 14 miles from Maricourt in the south to Serre to the north, with a diversionary attack at Gommecourt 2 miles further to the north. The first objective was to establish a new advanced line on the Montauban to Pozieres Ridge. In popular imagination, the title, “Battle of the Somme” has become a byword for military disaster. In the calamitous opening 24 hours the British Army suffered its highest number of casualties in a single day. The loss of great numbers of men from the same towns and villages had a profound impact on those at home. The first day was an abject failure and the following weeks and months of conflict assumed the nature of wearing-down warfare, a war of attrition, by the end of which both the attackers and defenders were totally exhausted. Adverse weather conditions i.e. the autumn rains and early winter sleet and snow turned the battlefield into morass of mud. Such intolerable physical conditions helped to bring to an end Allied offensive operations after four and a half months of slaughter. The fighting brought no significant breakthrough. Territorial gain was a strip of land approximately 20 miles wide by 6 miles deep, at enormous cost. British and Commonwealth forces were calculated to have 419,654 casualties (dead, wounded and missing) of which some 131,000 were dead. French casualties amounted to 204,253. German casualties were estimated between 450,000 to 600,000. In the spring of 1917, the German forces fell back to their newly prepared defences, the Hindenburg Line, and there were no further significant engagements in the Somme sector until the Germans mounted their major offensive in March 1918. The 1/6 DLI was to see further action at Butte de Warlencourt, an ancient burial mound, located between the towns of Albert and Bapaume in northern France. Bapaume was occupied by German troops. The British front line had advanced from a few miles north east of Albert in the direction of Bapaume to the feature known as the Butte de Warlencourt which lay a few miles to the south west of Bapaume. The Butte stood about 50 feet higher than the surrounding land and in theory provided a useful observation point for the Germans particularly towards High Wood and Martinpuich. The Butte was honeycombed with tunnels and dugouts which provided shelter for the German garrison. It had already resisted numerous British attacks over the previous month, October. The 3 DLI Battalions took over the front line positions and the 1/5 Borders came up behind them as the reserve battalion. The 1/6 DLI was a battalion recruited mainly in Bishop Auckland and the upper valley of the river Wear, who to the rest of the DLI were known as the “black-buttoned bastards”. The 1/6 was in the centre of the line. The 1/8 was to the right and the 1/9, known as the “Gateshead Ghurkas” was to the left. Together they would attack the Butte 5 November 1916. The 1/9 was under the command of Lieutenant Colonel Roland Bradford, a remarkable 24 years old man. His father, George Bradford was manager of Henry Stobart & Co. Ltd. collieries in the Bishop Auckland area and West Carterthorne Coal Co. He and his family lived at Carwood Cottage, Witton Park until 1894. The young Roland Bradford was educated at Queen Elizabeth’s Grammar School, Darlington before attending Epsom College, Surrey then pursuing an Army career with the DLI. The 1/9 DLI was charged with capturing the Butte and a quarry beside its west face. The 1/6 and 1/8 DLI were to seize the Gird Trench and Gird Support Trenches. The 28th Australian Division was to attack alongside the 8/DLI. In support, to the right were the 1/4 Northumberland Fusiliers, to the left, the 1/6 N.Fs. and the 1/5 Border Regiment were in reserve. Zero hour was set for 09.10 Sunday, 5 November. The 50th Division attacked with 1/8 DLI (151 Brigade) on the right. The men had to pull one another out of the mud before they could start. They almost reached the German front line but were stopped by machine gun fire and gradually fell back during the day. The 1/6 DLI suffered a similar fate except on the left where they linked with 1/9 DLI in the line. The 1/9 DLI went through 2 lines of German trenches, reached the Butte and established a post on the Bapaume road, some entering the Warlencourt line. But these advanced posts were forced back and at 10.00pm the enemy were still holding the quarry and 500 yards of the German front line. By midnight the Durham battalions had been forced back to their own lines. In the early hours of Sunday morning, the companies moved forward to man the front line trench. The weather was dreadful – heavy rain, a howling gale, it was bitterly cold and there were rumours that men had drowned in the mud. Owing to the boggy ground, progress was extremely slow. The trench was in a deplorable condition and the men had to march along the parados to reach their allocated places. Unfortunately, they were in full view of the enemy – shell, machine gun and rifle fire were thrown at them. As Zero Hour struck, all the available artillery laid down a barrage some 200 yards in front of the jumping off line. Brigadier General Hugh Tudor, Commander Royal Artillery, 9th Division. The Durham battalions went over the top with mud high above their knees, wading, slipping, stumbling and falling forward, laden with the usual infantry equipment necessary for such an attack (rifle, packs, grenades, entrenching tool, pick, Lewis gun drums). It was worse than they could ever have imagined. Clearly, the Germans were not caught by surprise and with such a narrow front attack they could concentrate all their machine gun fire on a devastating onslaught on the hapless Durhams. The British artillery failed to eliminate the German batteries. They opened up a barrage of shells all along the sector. They succeeded in isolating the British front line and cut off the assaulting troops from any reserves. The Durhams were isolated and fought the battle on their own. On the right the 1/8 DLI was badly hit by a combination of both German shell fire and British shells dropping short. They were even hit from behind by their own long range machine gun barrage that was meant to be supporting them. Many men had difficulty getting out of the trench and needed assistance from their mates – all under heavy fire. Despite this, the left of the line managed to get within 30 yards of the Butte before they were overwhelmed. The few survivors fell back in disarray to their original front line. The wounded were left scattered around No Man’s Land, marooned in shell holes and slowly sinking down. Many who were too weak to save themselves must have slowly drowned. The only success came on the left where the 1/9 DLI directly faced the Butte. Why this should have been is unclear but they swept up and over the Butte and by 10.00 they grabbed most of the low mound and the surrounding trenches, including the German front line trench, Gird trench. The first German counter attack commenced at about 12.00. Bombing attacks then hand to hand fighting took place. The 1/9 DLI was entirely cut off from any reinforcements by the accurate German artillery fire and well directed machine gun fire. As their numbers gradually dwindled, they fell back from their advanced position around the Butte to Butte Alley to where the 1/6 DLI had its bloc. Despite the desperate need for assistance, they hung on until 18.00 when the enemy launched another determined counter attack preceded by a terrific bombardment. Yet more German reinforcements appeared, hand to hand fighting and bayonet charges bit deep, the exhausted Durham men had been fighting all day with no respite. Retreat had become inevitable and the precious gains of the morning were lost to the German counter attack. Eventually the survivors fell back across No Man’s Land and the hard pressing Germans were soon threatening even the jumping off positions of the British front line. Back in the front line the Durhams re-joined their comrades of the 1/6th and the 1/8th Battalions who had fallen back hours before. After hard fighting, the Germans were held back and so, after a day of drama and death, the situation was exactly as it had been before they started. On the evening of 6th November, they were relieved by the 1/5 DLI who formed part of the 150th Brigade. Companies moved into battle positions about dawn, being rather late in getting onto position and it was daylight before “Z” Company arrived. 9.10AM Zero hour. Advance started well but got held up by machine gun and rifle fire before getting very far. 10AM “W” Company sent up on right to reinforce X Company. 11.35AM Battalion placed under command of Col. Bradford of 9th Durham Light Infantry in order to ensure safety of his right flank. 11.50AM 2ndLt G. W Robson ordered to bring up his raiding party and establish a double block on the right of the Battalion in the GIRD LINE. 12.30PM Commanding Officer (Major A.E. Ebworth) went to MAXWELL TRENCH and sent up men remaining there to reinforce companies in front. 4.20PM Sergeant Young reported at Headquarters with remainder of raiding party, 2Lt. G.W. Robson having been killed. This party were given flare lights to be taken to the QUARRY. 8PM 2Lt. K.B. Stuart and 2Lt. R.H.C. Wharrier collected about 150 men from MAXWELL TRENCH and endeavouring to get to THE BUTTE to reinforce 9th Durham Light Infantry, 2Lt. K.B. Stuart was killed. 11PM German counter attack forced 9th Durham Light Infantry to retire from ground gained. 1AM Orders to resume attack at 8AM cancelled. It should be noted that “missing” usually meant dead or POWs and some of the wounded would die. There are 10 officers and 264 other ranks of the above DLI Battalions with the 5 November 1916 recorded as their date of death. With almost 1000 casualties, misery was brought to many Durham homes. 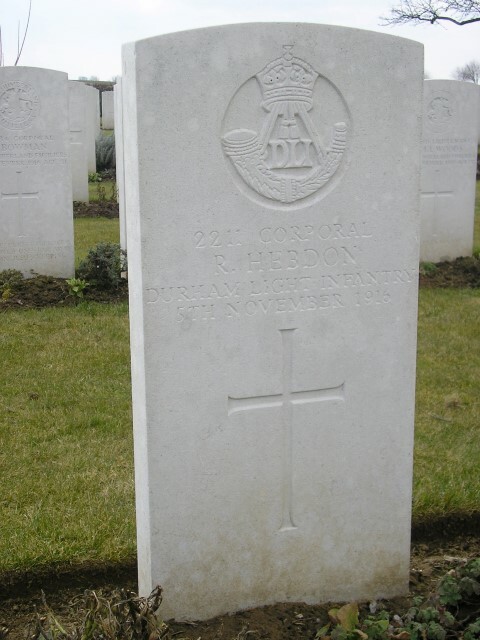 2211 Corporal Ralph Hebdon 1/6 DLI was killed in action 5 November 1916. 1672 Private Alfred Brown, 1/6 DLI, born in Evenwood, enlisted at Staindrop. He is buried in Warlencourt British Cemetery, grave ref. VIII. B.7 and is commemorated on the war memorial in St. Mary’s Parish Church, Staindrop. 3429 Private Fred Brunskill, 1/6 DLI, of High Etherley, enlisted Bishop Auckland and buried at Warlencourt British Cemetery, grave ref, VIII.B.11 and commemorated on Etherley War Memorial. 2264 Corporal George Henry Smith, 1/6 DLI, born Barnard Castle, enlisted Bishop Auckland – no known grave and commemorated on the Thiepval Memorial and Barnard Castle War Memorial. 3124 Private Robert Wilson, 1/6 DLI, of West Auckland, enlisted Bishop Auckland – no known grave and commemorated on the Thiepval Memorial and West Auckland War Memorial. So why had the attack failed? Perhaps Brigadier General Hugh Tudor and Lieutenant Colonel Roland Bradford had the answers. From the British trenches it was possible to prevent the Germans from using it as an observation point. It was a local operation, so costly and rarely worthwhile. Sadly, actions like the attack of the 151st Brigade on the Butte de Warlencourt had no real importance within the context of the Somme offensive. This kind of attack achieved nothing but swollen casualty lists. Any change in tactics would be too late for the gallant Durham men. The Western Front Association erected a Memorial to those who fell in the capture of the Butte de Warlencourt. The Butte is now clad with trees and the Memorial is positioned to the east on the high ground in a small clearing overlooking the battleground. The Commonwealth War Graves Commission Warlencourt Cemetery is located about a kilometre to the north, visible from the Memorial and here lie other souls who lost their lives in actions about that time. The First World War took a terrible toll on the DLI with more than 12,600 dead and thousands wounded. The Regiment was such a part of county life that there was hardly a family that hadn’t suffered. In 1922, the Regiment’s officers and the Cathedral Chapter resolved to create a memorial chapel in the south transept. The Bishop of Durham, Hensley Henson dedicated the Chapel 20 October 1923. The cross, to commemorate those who had fallen, was made and erected by Regimental Pioneers of the 9th Battalion using what scrap wood, ration and munitions boxes they could find. Another 2 smaller crosses were erected to commemorate the 6th and 8th Battalions and they stood together on the Butte de Warlencourt battlefield until they were removed in 1926. In February 1927, the large cross was then placed in the DLI Chapel and the other crosses were placed in St. Andrew’s Church, South Church, Bishop Auckland and the St. Mary’s and St. Cuthbert’s Church, Chester-le-Street. The St. Helen’s Colliery Memorial Cottages: 4 cottages built near the Colliery Institute, St. Helen’s Auckland constitute the local war memorial. 2 were erected (at a cost of £4,200) by Messrs. Pease & Partners, owners of the colliery and 2 by subscriptions of the men employed there. The formal opening took place Saturday 12 November 1921. Mr. F. Chapman presided and mentioned that the men employed at the colliery had subscribed no less than £2,600 for the benefit of the wives of soldiers during the war and since and were continuing the fund for the benefit of the widows and children. Mrs. R.A. Pease, Richmond and Mr. M.H. Kellett, Chilton, formerly manager of the colliery declared the respective pairs of houses open. Memorial tablets on the front of each pair of houses bear the names of the fallen and these tablets were unveiled by Mr. J.E. Brown-Humes. Mr. James Robson President of the Durham Miners’ Association made a few remarks. The tablet on the Memorial Cottage is inscribed “T. Hebden” but since Ralph lived at Tindale Crescent and worked as a coal miner and there are no other individuals with the name spelt “Hebden” and the initial “T” living in the locality then it is assumed with that this Ralph Hebdon is the correct serviceman. “In loving memory of Corp. Ralph Wm. 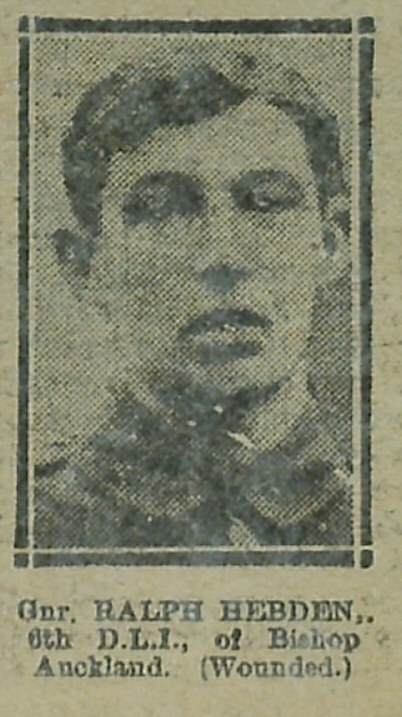 Hebdon, 6/DLI of Tindale Crescent, Bishop Auckland, who fell in action in France on November 5th 1916, age 26 years.